Category Archives: Who we are. Leaders of the Fincastle Gym. Posted in Who we are. Posted in Pokemon Organized Play events, Who we are. No League Sunday 8/17 – Look For The Gym At Worlds! Posted on August 11, 2014 | Comments Off on No League Sunday 8/17 – Look For The Gym At Worlds! 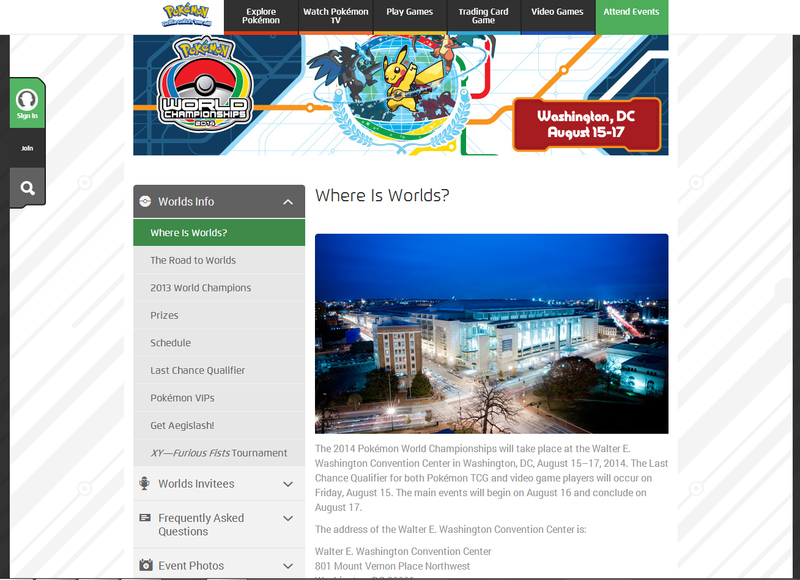 As mentioned in a previous post, the Fincastle Gym Leaders are headed to Washington DC this weekend for the Pokemon World Championships, so there will be no regular meeting of the Fincastle Pokemon League on Sunday, August 17. Look for articles about various trainers and VIPs daily under the News heading. For a live list of standings and pairings during the tournament Saturday and Sunday, click on the purple Standings bracket. You can see all the matchups in each division and their current records (Win, Loss, Tie). 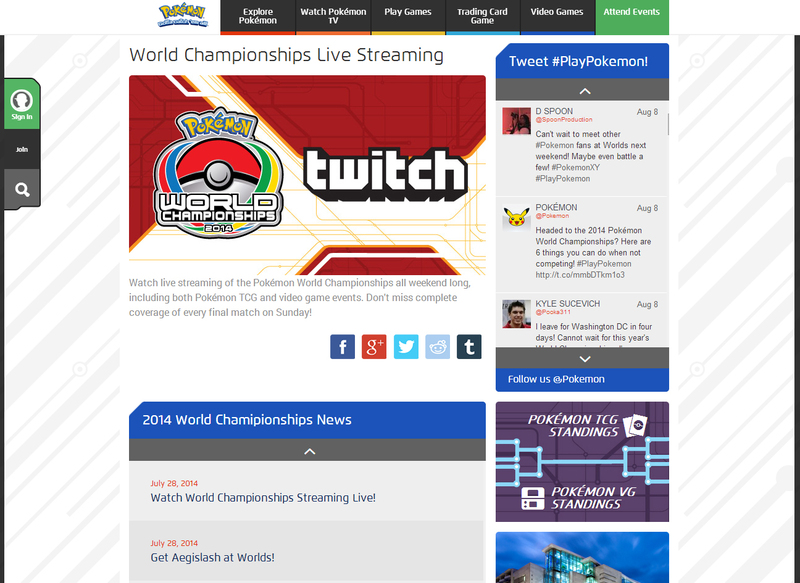 Click on the “World Championship information” link, and get lots more cool info. The final rounds in each age group (both Trading Card Game and Video Game) will be broadcast live on Sunday via Twitch. There will be additional live streaming throughout the event – so take a peek. You never know when you might see a familiar face! We will try to post an update or two during the weekend, but only as time permits. We expect this to be an exciting 3 days of tough Pokemon matches and we want to stay focused on supporting our Gym Leaders in their pursuit of the World’s best. Gym Leader Joel will have a full summary of the tournament and everyone’s journey after we return to Fincastle. Our next regular league meeting will be on Sunday, August 24 at 3PM. This weekend, cheer on Logan and Georgia as aim for the top of the year’s biggest Pokemon event! Until then, see you at the Gym! Comments Off on No League Sunday 8/17 – Look For The Gym At Worlds! Gym Leader Logan is Regional Champion! Posted on April 18, 2011 | Comments Off on Gym Leader Logan is Regional Champion! The Fincastle Pokemon Gym sent two of its leaders to Quinton, VA on 4/16 to the Play!Pokemon Regional Championship. Gym Leader Marthe went to act as a judge for the Senior Division while Gym Leader Logan went to compete in the Junior Division. There were three Regional Tournaments on the east coast, one in Pennsylvania, one in Georgia and the one in Virginia. 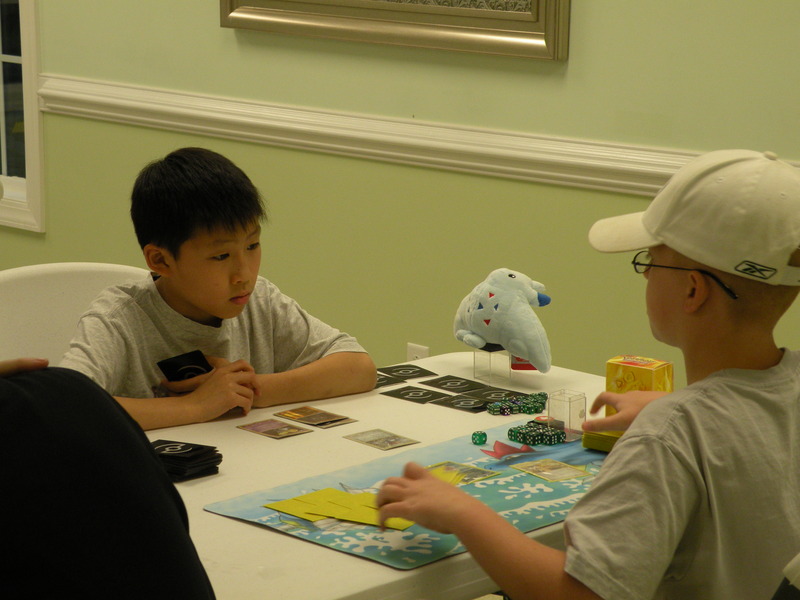 The Virginia event drew 150 players from Virginia, North Carolina, South Carolina, Maryland, West Virginia and Tennessee. Juniors played 5 rounds of “swiss” with a top cut of 4, Seniors played 6 rounds with a top cut of 8 and Masters players 7 rounds with a top cut of 16. Swiss rounds are single game matches. Top cut matches are the best 2 of 3. Logan entered the day as the #1 ranked player in Virginia. His performance definitely validated his ranking. Logan won all 5 rounds of “swiss”, defeating along the way North Carolina’s #2 Junior, Tracy R, in the 3rd round and one of the Virginia State finalists, Fabrizio L., in round 5. Logan stood as the only undefeated Junior after the opening 5 rounds. Tournament software rankings separated a logjam of players with 4-1 records to see who would join Logan in the top cut. In the semi-final round of top cut, Logan faced Justin K. in a best 2 of 3 match. Logan won in straight games and advanced to the final match where he squared off with Michael H. Michael defeated Austin K., Justin’s brother, in the other semi-final. Logan defeated Michael in straight games to take the championship. As in the North Carolina State Championship, Logan finished the day without losing a single game which, considering the competition, is an amazing feat. As Regional Champion, Logan was awarded a $1500 scholarship from Play!Pokemon. 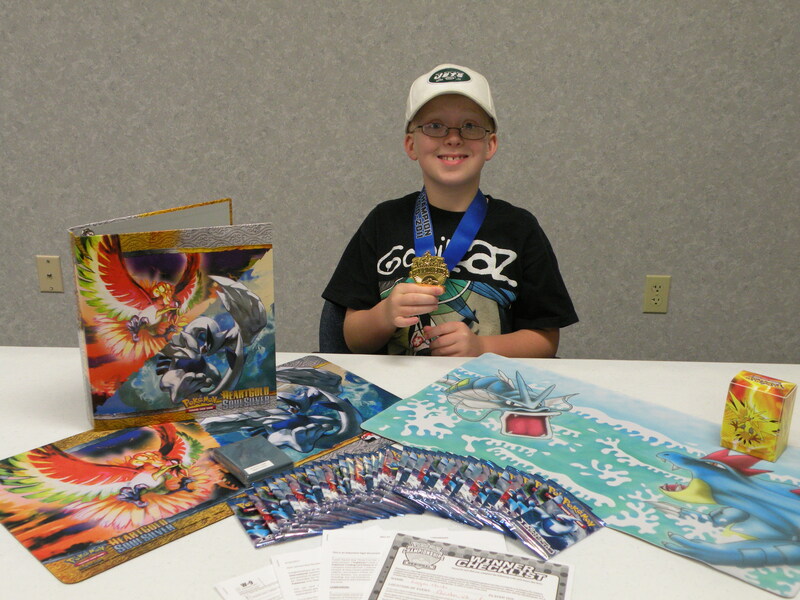 He received a box of 36 booster packs, a card binder, a card play mat and card sleeves. Logan will now have a 1st and 2nd round bye (2 automatic wins) at the National Championship in Indianapolis in July. Play!Pokemon also furnishes airfare and accommodations for Logan (and parents) to Indianapolis. While rankings have not been processed yet to account for the tournament results, the streak of wins should catapult Logan to one of the top spots in the country and greatly increase the odds that he will receive an invitation to the World Championships this August in San Diego. Congratulations to Logan. The Fincastle Gym Leaders and members are all proud of Logan’s accomplishments. Next up, the National Championship. Stay tuned! Comments Off on Gym Leader Logan is Regional Champion! Austin Is New Fire Type Gym Leader! Posted on April 3, 2011 | Comments Off on Austin Is New Fire Type Gym Leader! Today at the Fincastle Pokemon Gym, the Fire Gym Leader tournament came to a close. In the finals, which was a best 2 out of 3 match, Austin faced off with Gym Leader Logan. En route to the finals, Logan defeated Austin in the second round of the tournament, but Austin recovered and battled his way back to earn the rematch in the finals. In the first match, both players got off to slow starts, but as set up progressed, Austin got the advantage as his Charizard count outnumbered Logan’s Magmortar count. The match went back and forth with alternating knockouts. Thanks to some well placed rescue energies, Austin endured several 150-170 damage “Hard Crushes” to take game 1. The second match developed much like the first, this time with Logan taking the advantage. Logan was poised to take control of game 2 with a chance to knock out a belted Charizard, but he could not draw the double colorless energy needed to do so. 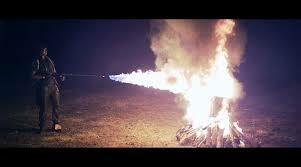 Austin knocked out his last Magmortar to take the match. It was exciting to watch the 2 very talented competitors with well built fire decks battle back and forth. Austin has continuously improved since his arrival at the Gym, and with the development of his understanding of opposing strategies (and a little patience), he has found his niche and is a perfect fit for the Fire Gym Leader. While Logan was disappointed with the loss, he and the other Gym Leaders welcome Austin to the ranks of the Fincastle Pokemon Gym. Having an additional leader will help the Gym get to challenges quicker, so hopefully those waiting will not to wait as long. If Austin is ready next week, he will be available for challenges. If he needs a week to prepare, he will be available the week after. Gym Leaders available will be posted next week at the Gym. On that note, the Fincastle Gym Leaders had four successful defenses of challenges today. Gym Leader Marthe defended two challenges for the electric badge and one for the psychic. Gym Leader Joel defended a challenge for the grass badge. That brings the Gym Leader’s record to 62-8 in challenges. It was a very busy and very exciting day. Join us next Sunday when we hope to make a huge dent in the list of those waiting for challenges. Get ready to battle you best and win a badge. See you at the Gym! Comments Off on Austin Is New Fire Type Gym Leader! Posted in Fincastle Pokemon Gym Meetings, Pokemon Organized Play events, Who we are. Rankings are in, Gym Leader Logan #1 in VA! Posted on March 29, 2011 | Comments Off on Rankings are in, Gym Leader Logan #1 in VA! With all of the State Championships now complete, Play!Pokemon has released rankings for the state, national and world levels. Thanks to successful showings in both the North Carolina and Virginia States, the Fincastle Pokemon Gym has two of its leaders ranked highly. In the Junior Division, Gym Leader Logan is ranked #1 in Virginia. Logan’s rating places him at #46 in the nation and #60 in the world. 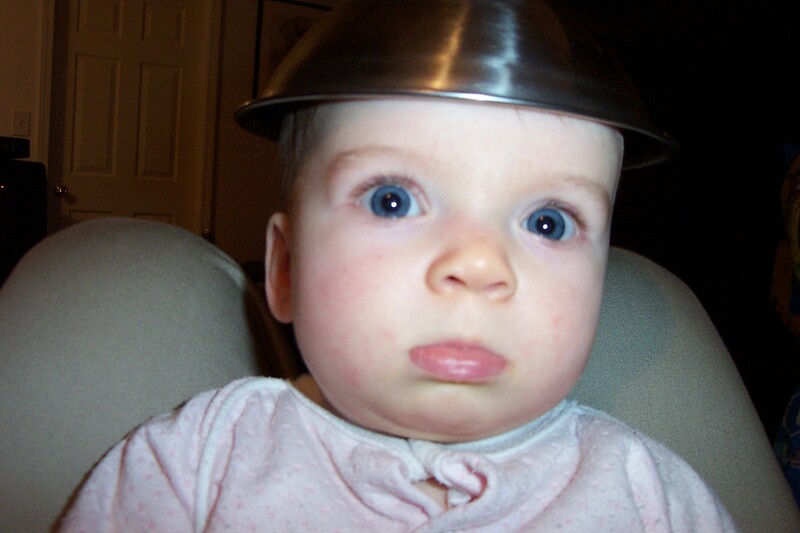 There are 1761 juniors registered nationally and 2610 in the world. His run at the North Carolina Championships vaulted him into the top spot in the state. It is safe to say that his win qualifies as a significant upset. Logan’s opponent that he defeated in NC finals, Blaine H is North Carolina’s #1. Blaine is #5 in the nation and #8 in the world. Blaine won the Virginia State Championship, where Logan finished in 6th place and never had a chance for a rematch with Blaine. Logan is busy practicing for the Regional Championships on April 16th in Quinton, VA. A strong showing there would strengthen his chances to earn an invitation to the World Championships in August. The regional champ receives travel and accommodations to Nationals. Logan knows that a win there will require some amazing play mixed with a little luck. Gym Leader Joel is ranked #12 in Virginia in the Masters Division. Joel’s rating places him at #392 in the nation and #542 in the world. By comparison to the Juniors, there are 5570 Masters registered in the nation and 8311 in the world. With that volume of players, the odds of battling into the Worlds in very slim. Joel is looking forward to Nationals and, with Logan’s help, continues to develop decks and strategies that will hopefully take the field by surprise. With the release of all new cards in Black & White coming between Regionals and Nationals, the National Championship should be very exciting and open to decks that no one has seen before. Come to the Gym and train with us. You never know what you might accomplish and we promise that you’ll have a good time. See you at the Gym! Comments Off on Rankings are in, Gym Leader Logan #1 in VA! Gym Leader Logan is North Carolina State Champion! Posted on March 14, 2011 | Comments Off on Gym Leader Logan is North Carolina State Champion! The Fincastle Pokemon Gym Leaders traveled to Cornelius, NC, for the North Carolina State Championship on Saturday. The event drew 128 entrants, which was the largest “States” yet in North Carolina. Georgia and Logan entered the Junior Division into a field of 20 players. Joel and Marthe entered a Master Division field of 86 competitors. Juniors played 5 rounds with a top cut of 4 players. Masters played 7 rounds with a top cut of 16. In top cuts, each round is a best 2 out of 3 match with the winner moving on to the next round. In the Master Division, Gym Leader Joel opened against Carolina’s own World Championship qualifier which he feared would be an auto-loss. However, Joel went to time and the “plus 3 turns” and won the opening round. This set the tone for the day as 4 of the 7 matches played by Joel went to either time or sudden death. At 3-2, Joel dropped a tight match off of a misplay in extra turns that cost him the chance to enter the top 16 playoff. Gym Leader Joel finished 4-3, ranked 22nd, pleased with some very tough wins but agonizing over the one play that cost him a chance at “top cutting.” That is the game of Pokemon at the State and above level… one play, one turn or even a coin flip can make the difference in a battle. In the Junior Division, Georgia opened with 2 losses, including an opening round loss to one of the eventual finalists. Georgia hung tough and went on to win 2 of her last three. Winning a match at States is an accomplishment considering the high level of competition. We are very proud of Georgia winning 2 matches and battling it out for 5 rounds. Being as successful as she has been so far at age 5, its hard to tell what she may accomplish in the years to come. The other eventual finalist was Logan. Logan ran through the competition winning all 5 rounds and entering the top cut as 1 of 2 undefeated players. Logan won his opening round in top cut in straight games and patiently awaited the victor of the other match which went back and forth for quite some time. He eventually faced off with Blaine H., who won the second semi-final against the other undefeated player, Tracy. Logan defeated Blaine in 2 straight games to win his first State Championship. For his efforts, Logan won a 1st place medal, 36 booster packs, a Play! Pokemon play mat and a $300 travel-voucher (to be redeemed upon his arrival at the National Championships in Indianapolis this July). Logan will also receive a 1st round bye at Nationals which means an automatic 1st round win. Logan’s play was nothing short of amazing. He’s battled hard at every Premier event he’s entered and never qualified for the Top Cut until this event. We could see it in his face that he knew this was his opportunity and that he was going after it. He played with a calm demeanor and was very precise in his decision making. What was the most satisfying for us was the fact that he displayed great sportsmanship as well. Logan embodied the very definition of a Gym Leader (and he’s a pretty good kid to boot). All of the Gym Leaders had great fun at what was an exciting and very tiring day. In addition to the successes mention above, the Gym Leaders won some great door prizes. The days winnings have once again revived the league’s supply of some really cool items that will make it into the prize lot for future tournaments at the Fincastle Pokemon Gym. See you at the Gym! Comments Off on Gym Leader Logan is North Carolina State Champion! A Professor must act with integrity at all times. A Professor should be fair and unbiased, whether judging a tournament or resolving a dispute. A Professor must be an honest individual. It is critical to the integrity of the Professor Program that its members have a reputation as trustworthy and honest. Professors are trusted with a great deal of responsibility. To maintain a higher degree of respect, Professors should act professionally when acting in an official capacity. Congratulations to Marthe, and we look forward to a great new year at the Fincastle Pokemon Gym. Marthe, the electric type Gym Leader, earned the position as the Fincastle Gym’s psychic leader on Sunday. Trainer Tyler defeated Gym Leader Logan’s psychic deck in the semi-finals and then squared off against Marthe on a best 2 of 3 match to determine the new leader. Tyler won the first match, but Marthe came back to take the last two in what was a very close and exciting final. It has been very exciting to see the level of play and competition rise quickly in the Fincastle Gym. League play continues every Sunday at 3:30pm. 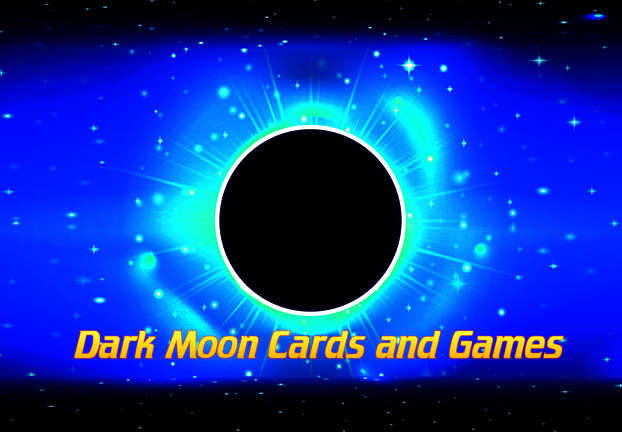 Marthe will be available to challenge for a psychic badge beginning on the 2nd Sunday in September. Posted in Fincastle Pokemon Gym Meetings, Who we are.